Whether you deem her divine or dismiss her as vile, Lady Gaga has been on the lips of too many of late to ignore the occasion of her second official release. What's not up for debate is her power to polarize; there are few who are indifferent to her. The haters want to steal the Lady's wardrobe even if they can't bear to listen to her songs, and the lovers are lining up for everything from signature headphones, a lock cut from her wig hair, and more from the Haus of Gaga. 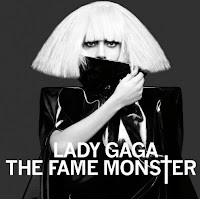 Gaga's monster hits so far have paired the catchiest, trashiest synth lines, lyrical rhymes, and X-Rated beats, (this record's "Bad Romance" included). 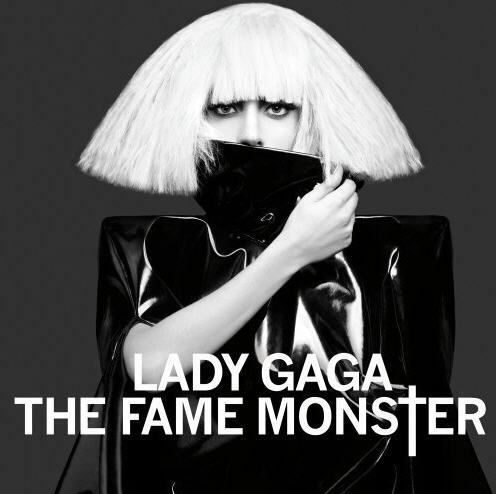 But if you're looking for more of this formula, I suggest you skip most of The Fame Monster. "Alejandro" is Madonna's "La Isla Bonita" and ABBA's "Fernando" done up by Ace of Base. "Speechless" showcases Gaga's love of The Beatles with a Sgt. Peppery lead lick, and "Telephone" has her swapping vox with Beyonce in synth-y R&B club style. There's lots of mid-90's Eurodance touches when she veers into Aqua territory or has one of those 'cool guy' spoken word bits ala Real McCoy or La Bouche. "Dance in the Dark" gets into a spookier groove musically, helped along by lyrics about vamps, tramps, and poison, and the lyrics in "Monster" - "He ate my heart and then he ate my brain" - are also kinda cute. But really, it's a stretch of the imagination to say this new crop of material is much darker than anything Rihanna, Beyonce, or Britney are making these days. One can only hope Lady Gaga's music catches up with her aesthetic and ideology. If she would dare to team up with IAMX's Chris Corner, she'd be unstoppable. Regardless, one look at the "Bad Romance" video and I am still left chanting, "Gaga Oh la la..."
I can not tell you how utterly indifferent I am to Lady Gaga, ga ga ga. I liked your interview with The Funeral Crashers. Whatever happened to them? You are a rare breed, then! As for the Crashers, those gents are no longer together, but their bassist is in a great new (but very different) group called Revel Hotel.